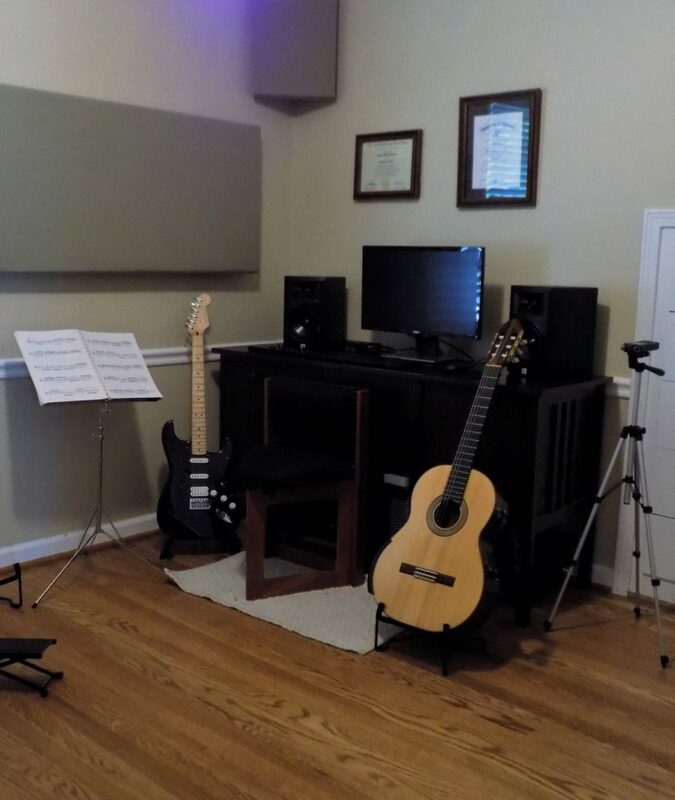 I offer private guitar lessons at my home studio in Overland Park, KS. It’s important to choose a teacher wisely. Many people just go to the local music store and start with whomever they’re assigned without looking into their musical and educational background. This can have serious consequences for the student, from not learning some of the most fundamental elements of musicianship to even having the whole idea of learning an instrument ultimately ruined for them. Another problem that I see a lot of recently is people trying to teach themselves via online video tutorials. The biggest problem with that approach is the lack of feedback from someone with professional experience. Also, people often get the wrong idea about what’s important to learn and when, frequently leading them down the wrong path. It’s not that there isn’t good and useful content, because there is, it’s a matter of not yet being experienced enough to judge it’s quality and appropriateness. I have been fortunate to have studied and earned degrees with some of the finest players in the world but I’ve also had moments in my development where I felt that I was completely stuck as both a guitar player and musician. When I was younger I skipped some fundamental steps in my development as a musician and it wasn’t until I studied with better teachers that I realized this and began to focus on the things that were holding me back. A good teacher will not let you skip the important stuff! I hear from potential students frequently that tell me that they’re stuck and tired of playing the same things and at the same level. Unfortunately, not everyone is ready to hear what they really need to do to move forward. I believe strongly in teaching students to become proficient in reading standard music notation (which includes counting and reading rhythms) and learning at least some basic music theory. Other instrumentalists learn these important fundamental skills as a matter of course, but for some reason, many aspiring guitarists decide that they simply don’t need to learn any of it. It’s a shame because these skills are not particularly difficult to learn! My top interest and field of study is classical guitar, though I play other styles as well. I’ve spent many years playing blues, rock and a little jazz and I continue to teach those styles as well. Being trained in classical guitar, the fingerstyle technique is my specialty. I enjoy teaching basics such as chord strumming and note reading as well as theory, songwriting, improvisation, composition, interpretation, and how to arrange for fingerstyle guitar. I teach complete beginners to advanced students and all ages, including young children. Parents are welcome to sit in on lessons. I should also mention that I don’t usually schedule lessons back to back because that’s something I’ve always disliked about teaching at music stores. I don’t want either myself or the student to feel rushed. I often go a little over the allotted lesson time if I feel the student needs more time to understand a concept, so I schedule some free time between lessons so that I can do this and take a quick break. This allows me to give the highest quality lessons possible. Please email me at jamesstephensguitar@gmail.com or feel free to call or text me at 816-682-0226 between the hours of 9:00 a.m. and 8:00 p.m. I’m happy to answer all of your questions. Please click below for my current lesson policy. I’m 52 and have been taking lessons from James a little over a year. First of all, James is a great guy and a solid family man. I would not hesitate to recommend him to parents with children who aspire to learn the guitar. James technical skills and knowledge are outstanding. He’s trained as a classical guitarist but can teach and play any type of music from Led Zeppelin to jazz. Being an adult with a demanding profession, I don’t always have time to practice as much as I’d like to but he understands that and is patient with me, but at the same time, he’s good at pushing me out of my comfort zone. My own daughter is a working musician/ singer /songwriter with a degree in commercial music, and I’ve even encouraged her to take lessons from James, to improve her guitar skills. I really can’t say enough good things about him. I highly recommend James. I’ve been taking guitar lessons from James for about two years and I have thoroughly enjoyed the experience and the amount and quality of the things I have learned. I think it is pertinent to mention that I am a 70-year old retiree, and I really look forward to my lesson as a highlight to my week. James has a VERY broad background in teaching all kinds of guitar disciplines, and I know there is no technique or type of guitar music that he couldn’t teach me in a relaxed, comfortable way. I’m having a blast.